Looking for a big ol’ marshmallow kitty to snuggle? Well, I have to say — I’m your man! My name is Eliot and giving hugs is the thing I do best. I’m a 12-year-old man and am fond of just about everybody. My favorite things include drooling on your shoulder, purring in your ear, and listening to all your secrets. I’m a cat person’s best friend! 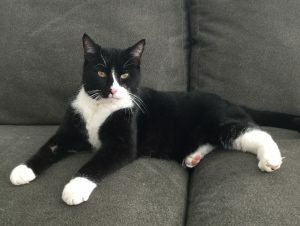 I have a very funny meow and will start a conversation with you if I want attention — or food, of course! I’m a big boy, so I’m perfect for snuggling up with. I’m a very easy-going but lively guy with a great personality and the looks to go along with it. All I need is a little catnip to get me playing like a kitten again! Do you have time for a hug? How about a hundred? We can snuggle every day if you take me home! Even though I’m older, I’ve already had a dental and a small dose of medication twice a day is all I need to maintain my great health. I’m currently living in a foster home, so fill out an application so we can meet today! 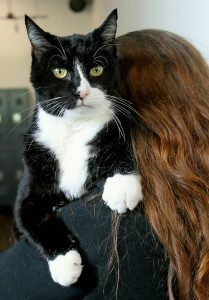 I come to you neutered, vaccinated, micro-chipped, (and with a recent dental already done) for an adoption fee of $80.